While my Chesapeake trout fishing has been limited, I learned good techniques for catching them in the Gulf of Mexico. They usually travel in schools and they aren’t too hard to catch. All you need is a light spinning outfit rigged with 8 to 10-pound test line. If you use braid, you might want to add a mono or flouro leader, but don’t go too heavy because they have good eyesight and they’ll see a big leader or other terminal tackle like snaps and swivels. Don’t sweat it, even though they have sharp teeth, bite-offs aren’t too common. Specks eat small minnows, little crabs, shrimps, and other small crustaceans. The best artificial lures are light bucktails, swimbaits, or twister-tail soft plastics that are four inches or smaller and light enoug h to retrieve barely off the bottom. I like one-quarter or even one-eighth ounce lures. Specks prefer nearshore waters where the bottom is grassy and sandy. 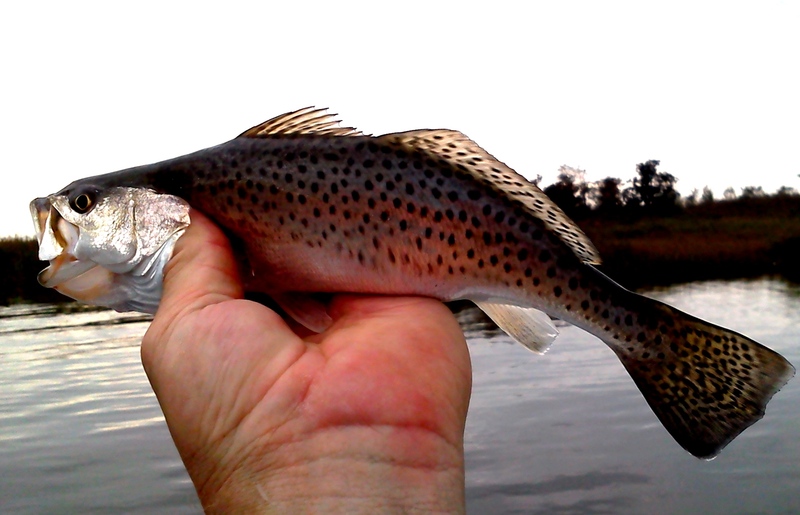 To catch trout right now in the Mid-bay your best bet is to head over to the Eastern Shore and look for grassy banks near water that is 3-feet deep or better. Banks that get good current are best. 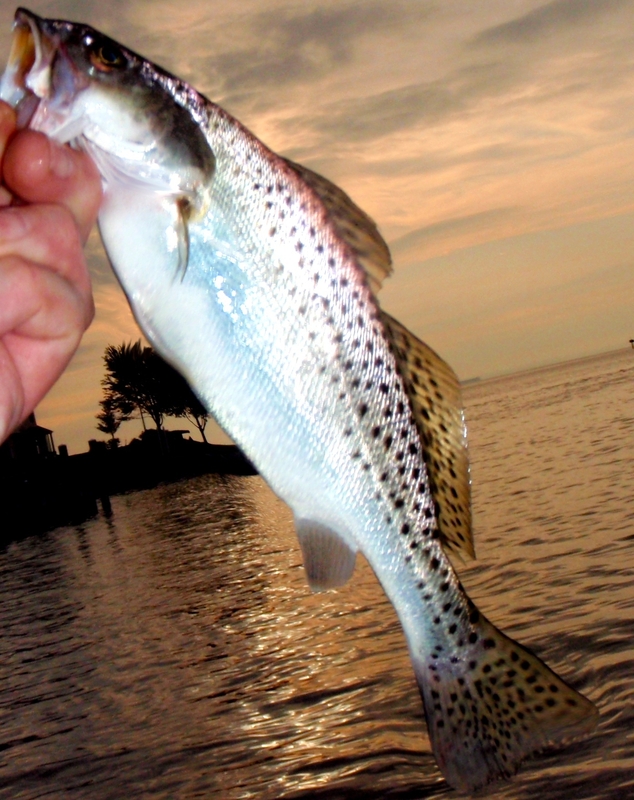 Since these are also good areas for top-water striper fishing, it makes sense to have one outfit rigged for stripers and another ready for trout. Just drift along the shore and cast toward the bank. When you feel a strike there’s no need to set the hook very hard. You can usually just raise your rod tip and start reeling. Since their mouths are soft, you’ll lose a few fish during the fight, but that’s all part of the challenge. Once you hook up, you can tell whether you’ve caught a trout or a rockfish right away just by the way your rod behaves. 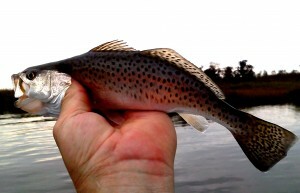 Speckled trout bend their long bodies back and forth when they’re trying to get off the hook. This will cause your rod to dip a little deeper than it does with stripers. In addition to good trout catching, the skinny water rockfish bite remains very good. 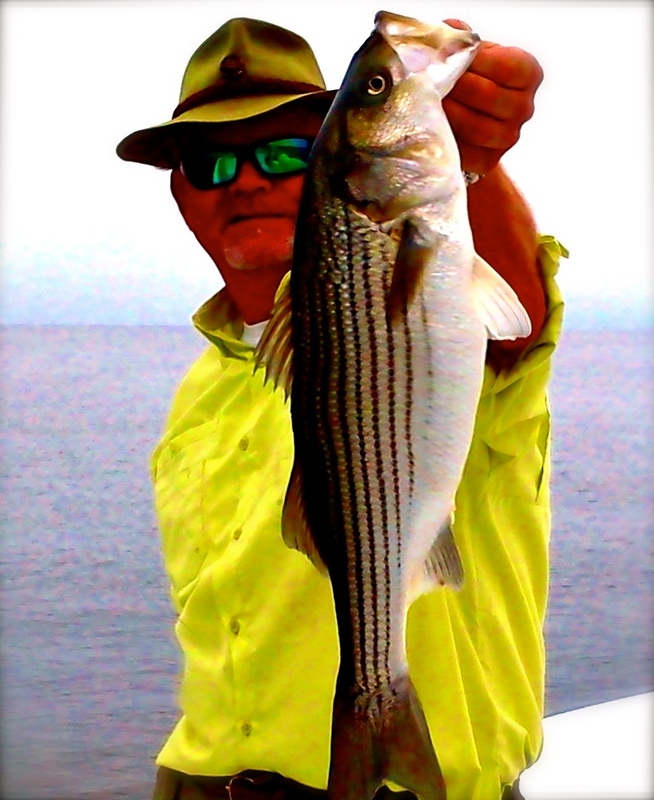 I fished several times over the weekend and had no problem finding stripers in the shallows along rocky banks. Most days brought dozens of blow-ups with almost all keeper- size rockfish. Since the water in the main stem of the Bay has cleared considerably, I moved out to throw topwater plugs at points and jetties near the main channel this week. The fish are there, but I still prefer the bite in the rivers right now. That may change soon because it’s almost time for big fish in the Upper Bay. If the pattern of the last three years holds, we could see some very nice stripers move into the area this coming week or next. Despite all the trash and debris we’ve seen over the past few weeks, the Bay is very beautiful right now. This past weekend I saw at least a dozen bald eagles in the trees around Kent Island. We even spotted a rare river otter one afternoon as we were drifting down a grassy bank. Good luck if you get out. This is a great time of year to fish the Chesapeake. Thanks for that. The Bay offers us much in the way of fish, wildlife, and beauty. Your reports on CLT are tremendous. So, not to get ahead of your pointing out an unusual opportunity to catch spec’s but… I’m new to fishing on the Bay, and last evening my Dad and I tried some of your techniques for shallow rockfish. Using a Smack-It I got a strike/explosion that was so loud that my Dad thought I had fallen in for a second. That was a 24 inch striper. 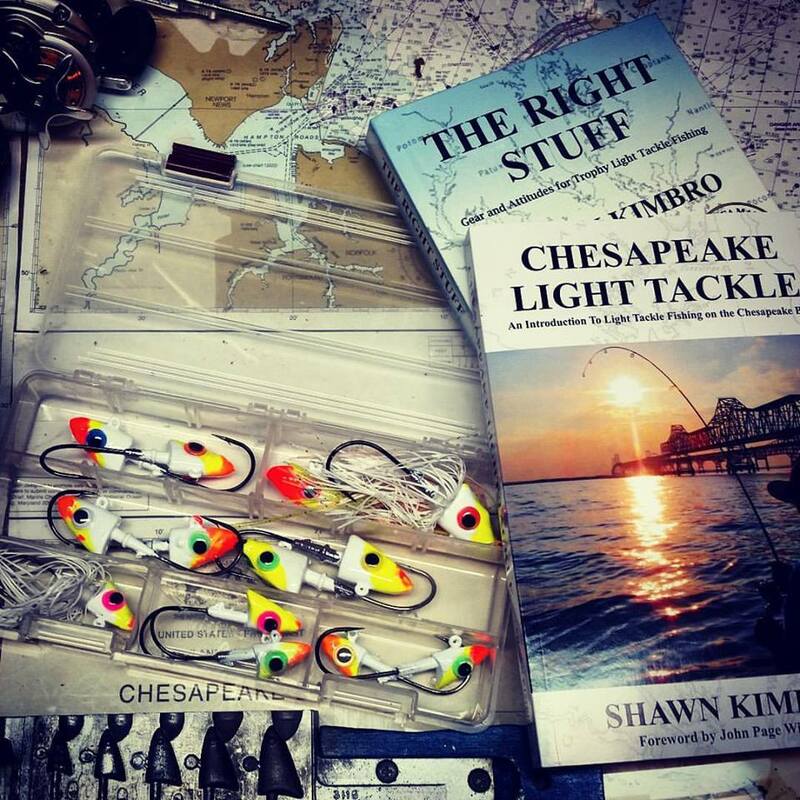 I am smiling as I read in your article, “it will soon be time for big fish in the Upper Bay.” OK, I’ll bring along that light spinning trout rig for now because you say to, but I will be thinking about “big fish.” That’s an exciting thought, esp. after last evening. I just came back from the store where I stocked up on topwater plugs. Why couldn’t you have said this yesterday! I’m just joking of course. It is nice to have different options. Joe Fish, I hope I hear some of those strike/explosions this week. Very nice to hear those topwater success stories. Keep em coming. I forgot to mention that you don’t have to go father down than Knapp’s Narrows to find the specks. 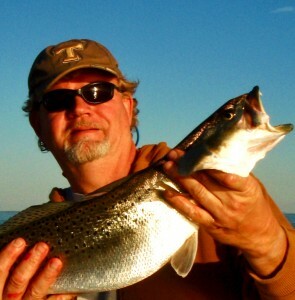 Jamie the “T” on that hat must stand for Trout!… lol… Nice Report Shawn. For what it’s worth, my crew and I had specks in the Kent Narrows area Monday this is a far north as I have found them and they were a welcome suprise! I never thought that it would be such fun to catch a 14″ fish. It really comes down to having the opportunity to find a beautiful fish in an area that hasn’t seen them in years. Regardless of what the guy in the safari hat says, size doesn’t matter when the tackle is appropriate. I chase specks a couple times a year in Carolina. Fun trip with a bunch of guys. 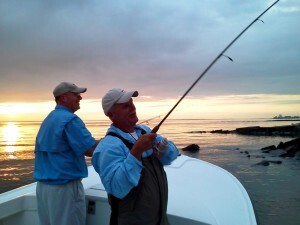 We fish the Pamilco Sound right behind Avon, NC. Just returned home last night after a week long trip. While this was the best trip in the last four years, looks like I could have stayed closer to home! I’d like to know what is happening to improve the trout fishing this year, especially this far north. Hope it keeps improving! Great article. Hope to see you on the water this fall. Nice report. Walleye Pete told me he had his best speck day ever, just a few days ago. I’m surprised they came this far north. Hope they are still around when I go out with him on the 17th. 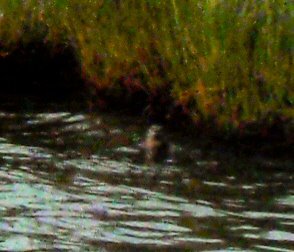 Well, it is still happening as my crew and I had a pair of nice specks yesterday while fishing for Rock 10-08-11… north of the Choptank River.